When a perfect design meets intelligence, products of high caliber are born. This is what we’ve done with Octasense, a perfect combination of performance design combined with cognitive intelligence to give our customers the combined tool to monitor & control their cities on one single unified platform. Octasense comes equipped with multi-dimensional and multi-capable high resolution lenses covering all sides of the street day & night. Equipped with AI, IoT and edge analytics, Octasense can think, adapt & react to situations as instructed by its users making it a smart device required tomorrow’s smart city. 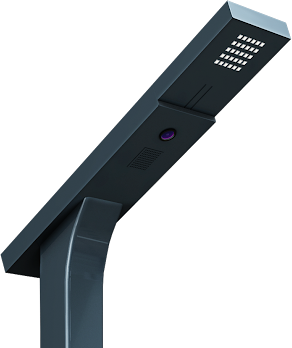 With multi-directional video perfectly stitched gives the municipal & law enforcement authorities one single view of the entire street & city for detection & tracking incidents & miscreants instantly making their cities smarter, safer and secure. It is a device that can interact and is interoperable with disparate equipments to capture data such as environmental measurements, traffic management, civic issues and also act as a medium between the municipal authorities and the citizenry like the public address system, emergency response systems and provide connected services like the WiFi hotspots, civic apps & more. All these working in tandem to create a social infrastructure to feel secure, safe and connect with the Government better for a better city and society.